I’ve seen the consequences on the health of men, women, and children of this country. While the World Health Organization has labelled glyphosate, a key ingredient of Monsanto’s Roundup, as ‘probably cariogenic,’ the reality is far from what’s been acknowledged so far. My journey into the heart of a poisoned Argentina started in the north, in the Misiones province, where thousands of farmers cultivate tobacco that will be exported to the United States and Europe, down to the mothers of the Ituzaingo province where glyphosate spraying on soybean crops has destroyed their communities and labelled their land as toxic. In a decade, cancer cases in children have increased threefold and malformations in newborn babies have gone up 400 percent. Women and men are fighting for their rights and their lives. Farmers, parents, doctors, scientists, lawyers. They cry, they shout, they hope, they suffer. They are met with silence. And the reality: their children are doomed. I have been searching for the truth with those who put together the pieces of a terrifying puzzle. These images might shock but I've decided to show the raw, often unbearable, reality. "Shows the harsh reality of the families of tobacco planters in Misiones." 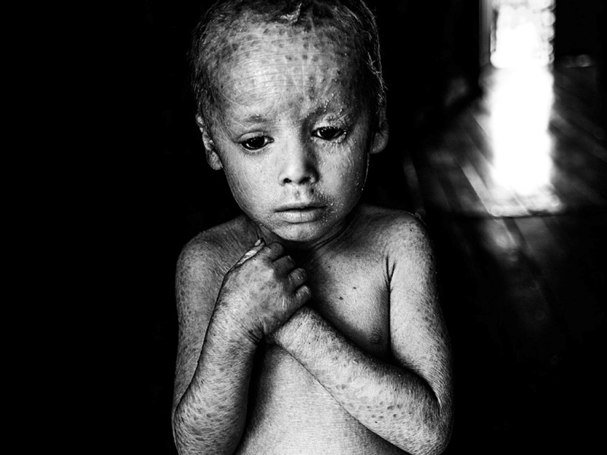 Lucas Texeira, aged 5, the son of a tobacco farmer, suffers Ichtyosis Lamellar. His skin itches, burns, and lacks pores so he cannot perspire and cool down.